MONKEYS ARE MY FRIEND: More Things are Growing! Guess what I found in our garden today? 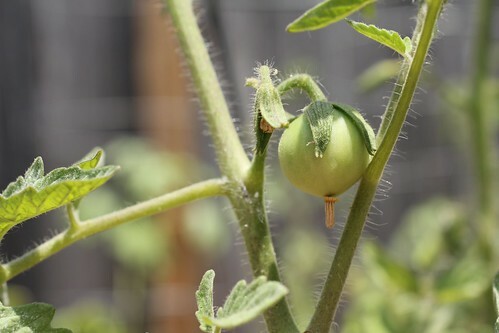 A baby tomato! Whee! It's about the size of a marble right now so it's got a ways to go before it is a real, live, edible tomato but hopefully it will get there. Theoretically it will be a Marglobe tomato (one Marglobe plant and one Roma were unmarked so I might have mixed them up while planting), which really doesn't mean anything to me currently, but hopefully it will by the end of the summer. So cross your fingers with me that this little 'mater becomes a big, red, edible one (and that Dan and I get to eat it, not the buggies)! In other news, the baby okra that was growing outside? Yeah, I went out the day after I posted my okra post and it had fallen off the plant. So my okra numbers are back to two. Sadness.